Okra can be cooked by braising, roasting, grilling, frying, sautéing. It cooks quickly so keep an eye on it, no matter which method you are using. Look for okra that has an even, bright color, whether that be red or green. 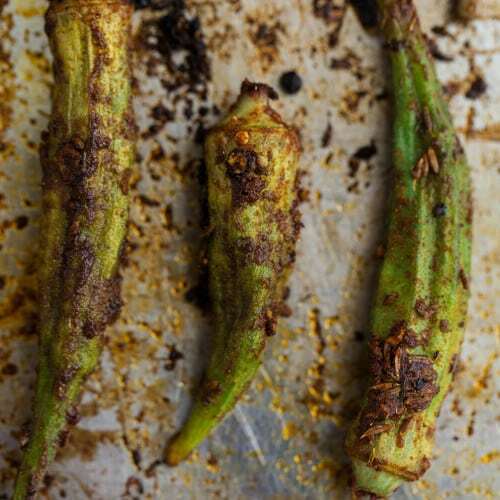 Okra should be free of cuts, discoloration and brown spots. It should also be on the smaller side, less than 4 inches, and crisply snap in half. Large okra can be eaten, but tends to have a woody texture. Store raw okra in an airtight container lined with a paper towel or tea towel. Okra doesn’t stay fresh for long, so plan on using within a couple days of purchase. Rinse right before cooking, and check for mold. While beautiful, okra has tendency to still have a soft/gummy texture (that is a defining characteristic of okra) when cooked, which is why it is one of the only vegetables, that for the most part, I don’t care for. I’ve tried numerous ways to prepare okra and it’s rare that I’ll like it. Alas, it’s a summer delicacy that has faint hints of asparagus, green beans, and eggplant. Okra is perfect in stews, acting as a thickener. I’ve also tried okra grilled and roasted, both of which help to develop a wonderful flavor. Okra can be fried and pickled, both treats during the summer. If cooking okra whole, trim the stem where the okra was attached to plant, being careful to not cut into the okra itself.